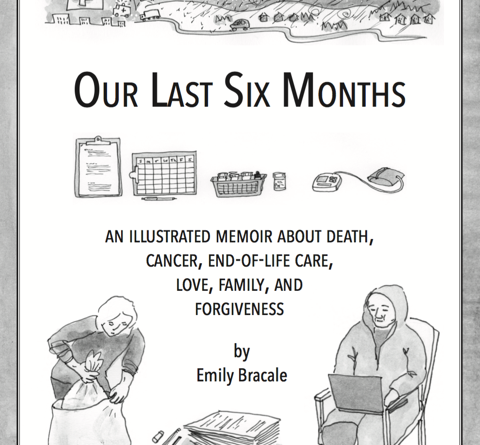 BLUE HILL — Author Emily Bracale will return to the Blue Hill Public Library to read and show images from her new book, “Our Last Six Months: an Illustrated Memoir about Death, Cancer, End-of-Life Care, Love, Family, and Forgiveness“ at 7 p.m. Thursday, March 22, at the library. This unusual hybrid memoir conveys half its story visually, through hundreds of cartoons, comics, and painted illustrations integrated with the text. The book is about Bracale’s friend, independent single dad Aubrey, who reveals that he has stage 4 cancer, whereupon “normal life” goes out the window for his ex-wife and their thirteen year old son. They and others witness his brave efforts to heal himself in his final months of life as he struggles to come to terms with his mortality. Emily Bracale is a lifelong artist and educator, and a graduate of the Interlochen Arts Academy and College of the Atlantic. She teaches adults and children on such diverse subjects as graphic design, landscape design, watercolor landscape painting, and nonfiction writing. She is also the author and illustrator of In the Lyme-Light: Portraits of Illness and Healing (2010).